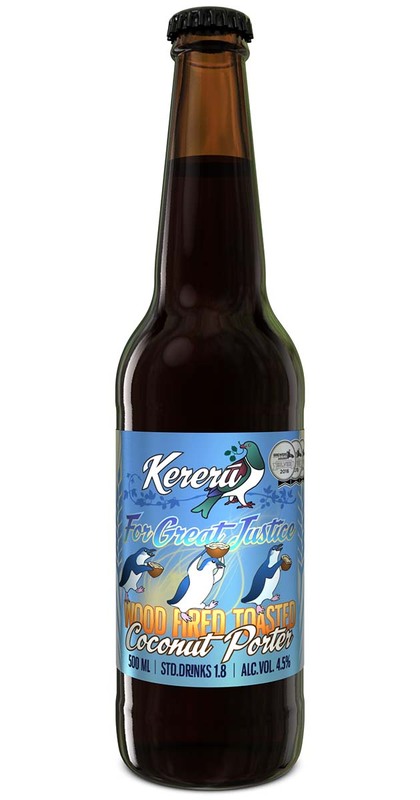 For Great Justice Coconut Porter is a smooth and flavoursome brown porter, and since its release, it’s become our signature beer! Made with all NZ malt and hops. Biscuit, brown, and chocolate malts meld with freshly toasted coconut to greet the senses. Goes very well on handpull and nitro-pour for a creamy finish. Serve cool but not chilled to allow the coconut to shine through. Water, NZ Barley, NZ Hops, Cocounut, Golden Syrup, Yeast. This brown porter infused with toasted coconut was brewed on request for our friend Justina. After a dramatic first brewing of this we developed a number of new techniques for infusing the coconut into the beer without blocking all of our hoses.